I’ve made a slow start but a start nonetheless in my new journal. 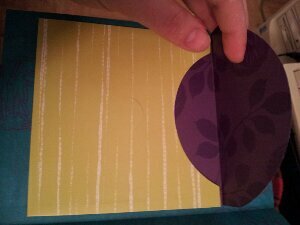 The purple flap has a magnetic closure. It has a glorious little pocket for love notes, fortune cookies and ticket stubs. 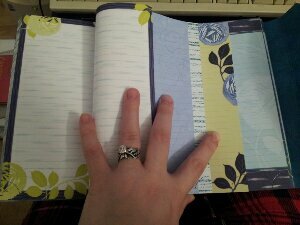 Similar to the pocket on moleskein journals. This one is about the size of a paper CD case. 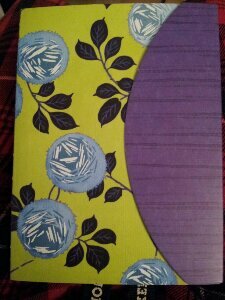 This is a thicker journal that I usually shy away from because of my tendency to become bored with the patterns or pages. This journal holds a pleasant surprise in that there are five or ten different patterns and colors. Like I said a slow start, I only have the first few pages filled. I hope to start throwing in some good notes and things for Christmas celebrations and grocery lists for Xmas cooking. I feel like most of my journals have a slow start. 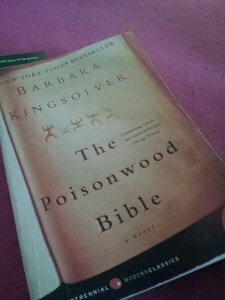 Like most novels you have to invest in a little time to gett to know the writing style and characters. I have to get to know the lax or taught spine and ease into how the paper soaks up the ink from my favorite pen. Speaking of pens, do you have a very specific pen, or style of ink pen you use for journaling? I am quite picky. In some journals I refused to write with a ballpoint pen at all. That made for tough times when I inevitably misplaced my fancier ink pen. Unlike school kids, most of my reading goes on during the fall and winter. These times of year are when things begin to slow down. Less work, on and off the farm, and less to do out of doors–if you’re cold natured like me. As things have slowed down, I have gotten to hang out with some of my siblings and our conversation circled around to, What books are you reading? Sadly, my answer was, nothing. So, I have made a point to change that! 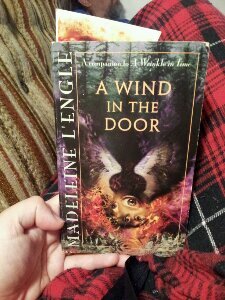 I am rereading this L’Engle book. A Wind in the Door. I read it as a kid and just began re-reading it this year. I still had a bookmark in it from months ago and found it wasn’t very hard to jump right back into the story. It is a tiny book, somewhere around two-hundred pages. So a great way to get back into a regular reading schedule. My sister loaned me a copy of a new manga she has been reading and really loves. 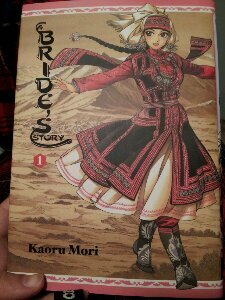 Bride Story by Kaoru Mori. Even my mom likes this manga, so I am pumped to find out what she is so enthralled with. Or try What Should I Read Next? 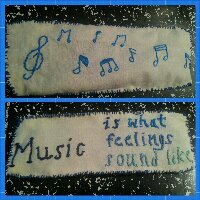 I found these websites accidentally on Pinterest and love the idea. Type in a book you have read and liked, it will find a list of books similar to it. My results from the second website showed some similar books I love and some new books I have never stumbled on. Make some tea and take some time to read today. Yesterday, I was planning some games for my SiLs Golden Birthday Party (where your age matches the numerical day you were born). I have several great games in the forming stage of awesome. The party is a Potluck/Bookluck, in which guests will bring a dish inspired by a book, its recipe and a copy of any kind of good book for the birthday girl. This game is Book Title Guesstures/charades and yes, I realize that I did not invent this game. Guests will pull a slip of paper with a book title on it and have to act it out. 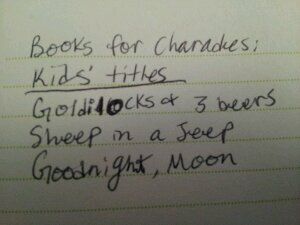 This was the first bit of my kids’ book list…notice anything wrong? Shortly after starting this list I went and got a beer because I obviously needed one. Book Think–Given a letter of the alphabet, players must come up with a book title or character. “The” and “a” do not count. Book Scavenger Hunt— Large pile of picture books and chapter books. Players must find words, sentences, characters, copyright dates, photos of the author, etc. Book Pickup Lines– Nerd/HP glasses and offer the best bookish pickup lines to birthday girl. We will try to write these down or record people saying them. Poem Writer Book Search– Each player must create a poem, but their word bank only consists of those found in a kids picture book. Making Bookmarks— Okay, this is a craft not a game, but I figure this might be fun to try. Stamps, construction paper, ribbon, jewels, etc. Who is it?— Group activity or one at a time. Either played as a 20 questions game or as group guesses. Read off hints and everyone writes down who the clue is about. Then go thru list again and reveal the identities. Started reading a new book and yes, I know that is very silly considering I’m leaving soon. I wanted to give it a taste before I left for Spain. I’m only a couple of chapters in and each chapter is from a different characters’ point of view. So it is kinda like I’ve read the first week of this family’s adventures in the Congo from four different perspectives. The trouble with each chapter having a different perspective is that they think and will use language differently. I’ve read other books that use this style successfully. So far, the characters are quite similar and shallow. There is a big difference in vocabulary between the five year old and the rest of the family. Even so, the five year old talks more like L’Engle’s Charles Wallace than any real child. Currently, I’m on the hunt for a skinny paperback for the plane ride to Spain. I think I need to take a dive at the used bookstore nearby. 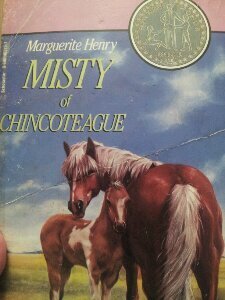 I just finished the book Misty of Chincoteague. I know it’s an ancient little kids’ book but there are so many people defined by stories like these. The writing style was dated but sweet. I imagine if I read this when I was eight or ten years old I would have begun saving every penny to buy a pony. Can I borrow someone’s little girl and read this story aloud to her? Okay…that might have sounded weird. This whoops on the back of the book had me confused for a while. 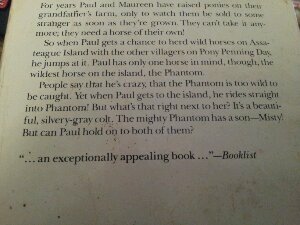 It says Phantom has a male baby, when all through the book, Misty is a female. How is she doing? Ashi Danza!! She is doing quite well. As you may recall, I posted about my winter goals not too long ago. And I am doing so well that I may have to update my challenges. I intend on going back to finish reading the Salzman book but I just got tired of renewing it from the library at present. I am currently reading The Professor and the Madman by Simon Winchester. It is a non-fiction book about how the Oxford English Dictionary came about. Fairly interesting so far, but I’m just a couple of chapters into it. The holidays are not friendly for folks trying to get reading done. There is so much to do and obligations (although enjoyable) that one must fulfill. Don’t worry. I’m sure I’ll get plenty of reading done in the next few months ahead. They are for the most part dead months and terrible weather outdoors sends readers under the covers. 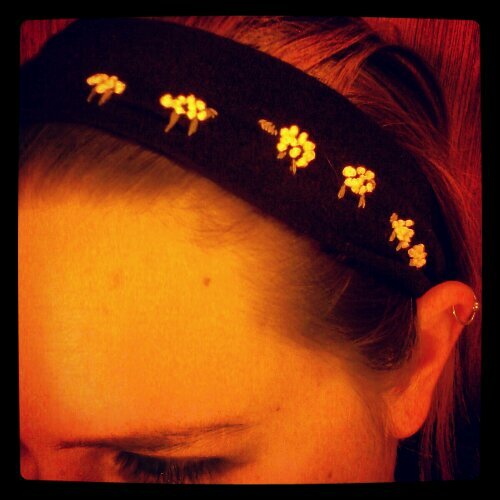 I have a few other projects planned but it seems to take me ages to go from the planning to the stitching phase. I love planning them though. I have made pretty much zero progress on my belly dancing and short story writing goals. I did do a quite youtube search for a belly dancing video and found a decent one but haven’t made any moves yet.